Description: Beautiful rolling land boasts an income producing equestrian facility w 33,120 sqft barn that includes approx. 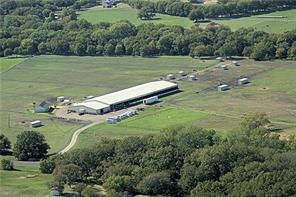 100x200 arena, 60ft round pen, 18 stalls, 2 wash racks, 2 tack rooms, feed room and 3 storage areas and restroom. Excellent pastures are cross fenced w 11 loafing sheds. 3 bdrm, 1 bath apartment or guest quarters w outside entrance. The main home is 2 bdrm, 2 bath ranch style austin stone that overlooks equestrian facility and scenic pastures. Features great floor plan and designed for easy living with hard surface flooring. Plenty of space for a larger custom home site. Pond, gaited entry, pipe fencing, great road frontage on n hwy 77, easy access and location is just 45 minutes south of dallas.